One of the well-known cinema chains world over, UCI Cinemas is a brand that focuses on customer experience. 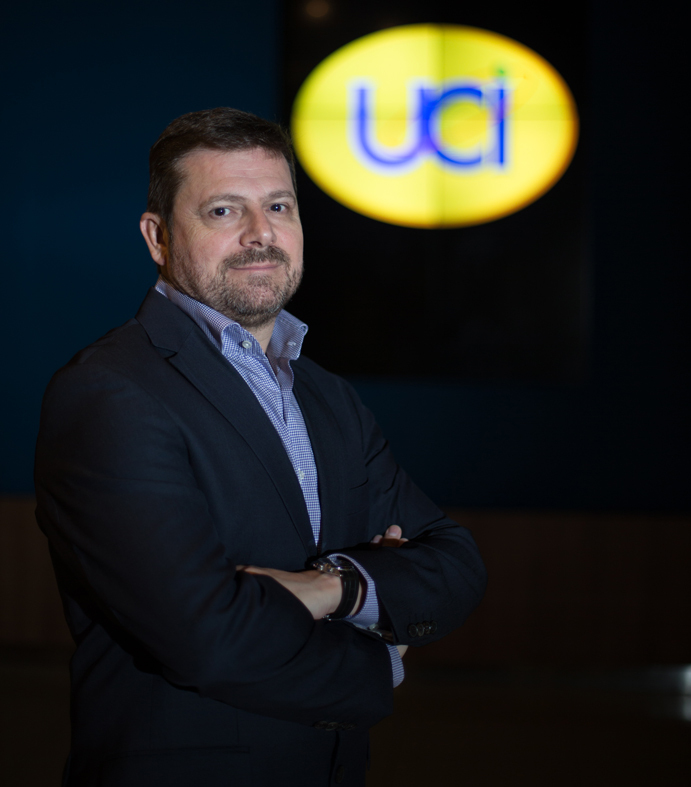 Carlos Marin, Managing Director, UCI Cinemas, has played a pivotal role in making it the largest multiplex cinema in Brazil. He will receive the “International Exhibitor of the Year Award” at ShowEast 2017. United Cinemas International (UCI Cinemas) is a brand of cinema, currently operating in Brazil, Austria, Germany, Italy and Portugal. In Brazil, UCI cinemas are owned by National Amusements. Customer experience is a major focus of this trusted brand. Carlos Marin, Managing Director, United Cinemas International (UCI), will receive this year’s “International Exhibitor of the Year Award” at ShowEast. Marin will be presented with this special honor as a part of the International Awards Luncheon on October 24 at the Loews Miami Beach. Marin was born in Barcelona, Spain and graduated with a degree in Economics at the Universitat de Barcelona and also holds an MBA in Business Administration from the Universitat Autònoma de Barcelona. He moved to Brazil in 1996 and became the Director of Finance at United Cinemas International. In 1998, he helped lead the opening of UCI’s first multiplex and since then it has become the largest multiplex cinema in Brazil. In 2003, Marin was promoted to Managing Director and following his promotion in 2005; National Amusements took over the UCI’s shares in Brazil. Since its arrival in Brazil, UCI has opened 23 multiplexes with 194 screens in 12 cities across the country: Rio de Janeiro, São Paulo, Recife, Fortaleza, Curitiba, São Luís, Campo Grande, Manaus, Ribeirão Preto, Salvador, Juiz de Fora e Belém. Running four of the seven highest sites in attendance in Brazil, UCI is always searching for the best technologies and for more innovation. In 2001, UCI was responsible for the first digital screens in Brazil and in 2010, UCI partnered with Sony, to bring 4K technology in Brazil exclusively to UCI Cinemas. In 2011, UCI Brazil presented the first IMAX screen in Rio de Janeiro and incorporated a new concept to the company, the VIP Deluxe theaters, with special guest services, private lounges, luxury seats and a special menu. Currently UCI is the largest IMAX operator in Brazil and under Marin’s leadership, UCI opened their first 4DX theater last June. Congratulations on being the recipient of the “International Exhibitor of the Year Award” at ShowEast! What does this recognition mean to you? Thank you very much. It means a huge motivation to continue improving the quality of my work every day. After 29 years in this business, it’s a recognition for the team we have been building on over the years. National Amusements (NAI), our parent company, best owed its trust in me from day one. And my family always understood my passion for this industry and gave me the energy and inspiration to keep going. Tell us about UCI’s presence and its screen count? The UCI Group, which comprises JV partnerships with Severiano Ribeiro and Orient groups, operates 194 screens in 23 sites located in 12 cities; seven of the cities among the top 10 most populated cities in Brazil! The highest concentration of the UCI business is in Rio de Janeiro, where our Head Office is based, as well as the UCI’s flagship at NYCC’s mall with 18 screens and 4000 seats (the most successful cinema in Brazil since its opening in 1999). The UCI operation is especially strong in three main cities in the North-East of the country (Salvador, Recife and Fortaleza) and also has very good operations in the São Paulo market. Since 1997, when UCI’s first multiplex was unveiled, it has become one the largest multiplex cinema chain in Brazil. How do you see the transformation of the company? When I look back I cannot believe it’s the same company. I still remember when we were looking for our first office space, hiring our first batch of employees and buying the first set of computers. Back then, the multiplex concept was completely new in a market operated only by Brazilian companies. To establish our business and build relationships was a challenge. The company’s transformation has been conditioned by the turbulences in the Brazilian economy. We have had to adapt to certain structural changes along the line. When UCI became a NAI’s subsidiary in 2005, it was an inflexion point. The main expansion period of the company happened and the focus on the customer service brought more resources to prepare the company for the next transformation. Born and brought up in Spain and then moving to Brazil for work, how was your personal journey of understanding the nuances of a different country and its culture? Moving to Brazil to work and live in a different culture was indeed a challenge. But I always saw it as an opportunity to learn and improve as a professional and an individual. Living without family in a new culture and country, I tried to seek as much information as possible about Brazilian market, its people and their business culture. This was a very important period. This is something that you have to live for yourself. Taking a retrospective look, Brazilian cinema industry has witnessed many ups and downs. How would you describe the present scenario of cinema and cinema exhibition? Just like cinema world over, the Brazilian film industry has gone through many challenges to get consistency in terms of commercial diversity. In the last few years, the content has concentrated on comedies. With growth and increase in shopping malls across the county, the screen count has increased year by year with the consequent rise in tickets sold. However, the economic crisis has slowed down the opening of new shopping malls as well as the new screens. But the market is still performing well and Brazilian exhibitors are introspecting their own investments in the existing operations to increase the level of profitability. Tell us more about the Brazilian cinemagoers and their expectations. The one word to describe Brazilian cinemagoers is “enthusiastic”. Brazilians are very enthusiastic and this reflects in their leisure and entertainment choices. One can experience the way the audience engage with the films inside the auditorium. As Brazil has a young population, it is common to see families going to the cinemas. Animation films and films based on comic characters do well in Brazil. Brazilian moviegoers are very curious and receptive to new technology and services. Social media is widely used as a medium to share cinema experience. When Brazilian moviegoers are given value for their money, they become loyal customers. What in your opinion is the USP of UCI? UCI DELUX auditoriums with reclining seats, exclusive lounge with food service that can be order inside the auditoriums; SUPER SEATS (extra large seats) in some rows of conventional auditoriums, coffee shops and now the 4DX experience. The goal is to satisfy our customers with their preferred moviegoing experience for each moment. UCI has always been on the top of things – whether it’s the largest IMAX operator in Brazil or opening the first 4DX theatre. What next can we expect from UCI? We would like to provide our customers all possible cinemagoing experiences. We want to make cinema a place where they look forward to spending time with their family. We can provide something that nobody has by improving the quality of projection using laser technology and creating a unique experience using virtual reality. These are the two aspects that UCI is working on. Tell us more about your expansion strategy. The organic growth will be slower until the growth of new shopping malls picks up again. In the meantime, a new site will be operational this year and some existing sites will have additional auditoriums, increasing the UCI screen count. We will be looking at opportunities that make sense for us in primary markets. UCI is not going to expand to get more market share without payback. There needs to be a healthy expansion to gear up for the consolidation of the market. In an industry that is booming with multiplexes, what could be the game changer in your opinion? I see two possible game changers. One is specific to Brazil i.e. an irrational increase in the level of screens saturating some markets, which will impact the moviegoing experience. At global level, the game changer is the VOD and streaming companies. The reduction of the exhibition window in my opinion would be harmful to everyone in the long run. As the Managing Director of UCI, what is your vision and mission for the company? It’s the customers, employees and stakeholders who make a company. We need to build a company that is able to find the point of balance to satisfy them all!